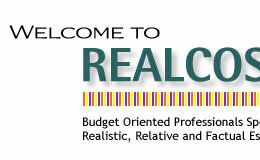 About Realcost Quantity Surveying Inc.
Our first goal is to provide reliable, realistic and factual information on this website, for all concerned. 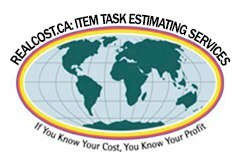 Our second goal is to teach sub-trade contractors how to provide better estimates for their clients. There may be two parties involved who will see the same information at hand. The provider and the payee may see the same information provided. Only the fair minded in this business shall survive in the end. Both expressed in unit measures. Persons and companies who are in need of fair reliable pricing information can select from various options on this website. To the general public, pricing is provided by way of Sample Project and	in most cases those samples are small in nature. The	principle of small and larger projects in our system are similar, the process is the same. Sample projects are priced by (Item Tasks.) The client can determine what shall be included in the estimate as per the description stated. 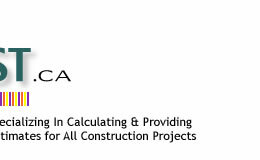 He or she that should receive more than one estimate for any project he	or she must undertake, by analyzing both estimates by comparison. It is vital for any client to make up a good set of specifications of their undertaken process. Planning is the key for success. If there is more than one person involved in the process, it would be advisable to make up two separate lists	of requirements and when completed compare and settle the combined needs. You will be amazed. (Please settle before it gets out of	hand). Clients	should have a clear vision of the end product before starting any project, and arrange the funds in advance for payments. Each agreement between client and contractor shall not be one sided in nature. Seek advice in a professional way.